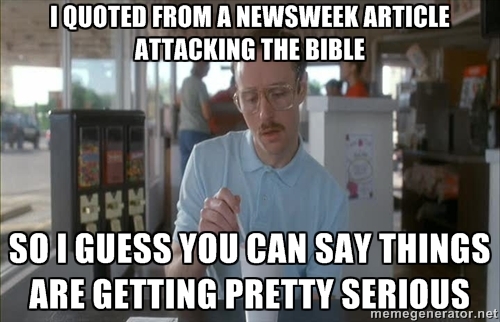 Earlier in December I wrote a piece concerning the recent Newsweek article attacking the Bible titled “The Irony of Kurt Eichenwald’s Ending in His Newsweek Article Attacking the Bible.” Originally I was going to write a series of posts responding to Kurt’s hit piece but the Holiday season made it difficult. But alas, there is nothing new under the sun and fortunately there have been many Christian responses to the article already. Rather than be redundant, I thought I share in this post some of the responses out there available online already. I think Christians responding to the article is good; it’s sad for me seeing how some people would only look up to these routine sensational pieces from Time and Newsweek and think it is serious scholarship against Christianity when there are scholarly responses out there. I think the ignorance and pseudo-scholarship is so bad it’s a sin. Always make a ready defense! Sleep well Jim! Lord bless you and yours! I hope you have a good New Year! Thanks for sharing these rebuttals. May the Lord honor those who properly honor His Word and work in the hearts of those who deny and reject it. May you and your family have a blessed New Years! You are welcome brother! I appreciate your compilation of the various responses!